Cricketer Nathan Lyon took his glamorous girlfriend, Emma McCarthy, as his date to the Australian Cricket Awards in Melbourne on Monday night. The couple both shared snaps of the event on their respective Instagram accounts. “Thank you to @pallascouture and @mjbale for kitting us out last night! A great night had by everyone, congrats to all the award winners and the hall of game inductees!” the 31-year-old spin bowler captioned his photo of the pair. Meanwhile, McCarthy simply wrote “My Love. So proud,” alongside a similar photo of herself and Lyons, who was nominated for the prestigious Allan Border Medal. 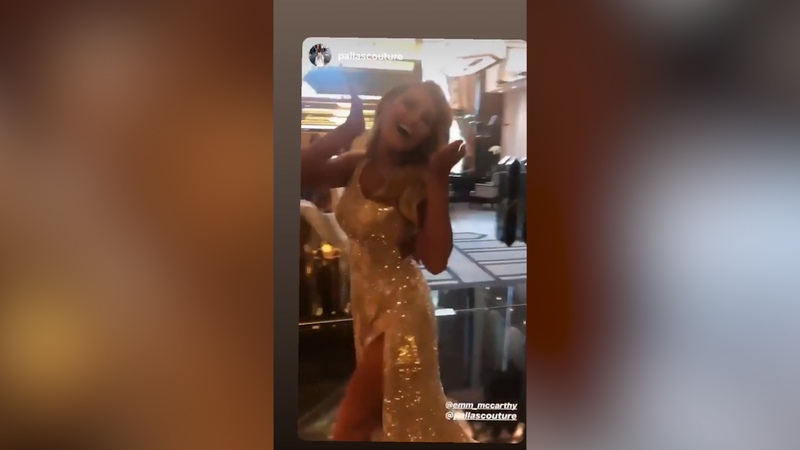 And even though Lyon didn’t win the Allan Border Medal — the most prestigious award in Australian cricket, which went to Pat Cummins — McCarthy was still reminiscing about the night they had on her Instagram this morning. “Last night. Could not have asked for a more beautiful team,” she wrote, thanking everyone who helped her prepare for the glamorous night out. Last night’s Allan Border Medal marked the first time Lyon had taken McCarthy to the event, even though they have been dating since December 2017. The same time three years ago, Lyon’s date was his then-pregnant partner, Melissa Waring, who is the mother of his two young daughters, Harper and Milla. Lyon and Waring split later that year.